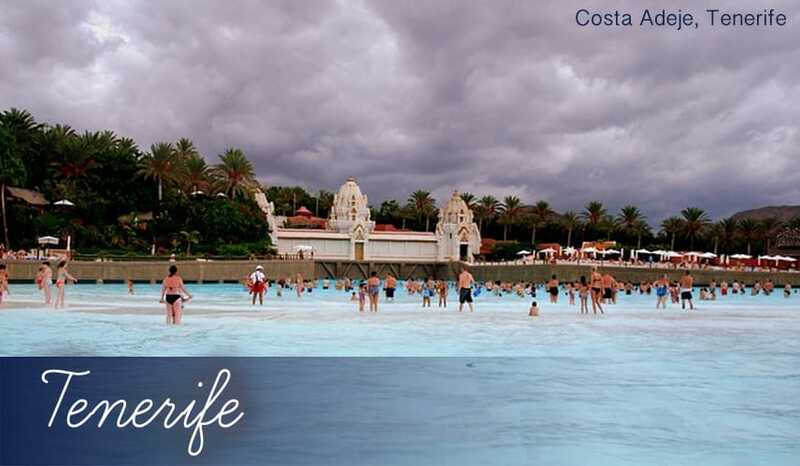 Beach holidays: With Costa Adeje holidays you’ve got four great beaches to choose from. All have dusky volcanic sand and clear blue water. Being well facilitated, the beaches Troya I and II are the most popular, whereas Playa Del Duque Beach is quieter for more relaxing holidays on the coast. Delicious dining: There are restaurants with influences of every kind on Costa Adeje holidays. If you prefer simply cooked British cuisine on your Costa Adeje all inclusive holidays 2019 you’ll feel right at home here, while there are also plenty of authentic Spanish eateries too. Walking holidays: If you’re into rambling, you’ll find lots to love here! Inland, holidays to Tenerife are dense with forests and dramatic cliff faces. The Hell’s Gorge walk on Costa Adeje holidays is considered the best and takes in waterfalls, huge pine trees and arid desert landscapes. Luxury shopping centres: Costa Adeje holidays are some of the best in Tenerife for shopping. The Gran Sur and Plaza El Duque in particular are well stocked with modern facilities. Playa Americas is also in Tenerife, which is one of our top destinations. To read specific resort information click "Playa Americas Holidays". Costa Adeje Golf Course: This Championship-level course has 18 holes of golfing bliss. Across the flat green fairways and you’ll really appreciate the clear blue skies on the many hot sunny days holidays in Tenerife enjoy. Karting Club Las Americas: The smaller of the two go-karting courses in Tenerife (the other one is named Karting ClubTenerife). This one is much easier to get to if you’re having your holidays in Costa Adeje. It makes for a fun day out, with two different tracks for kids and adults. Troya I Beach: The palm-tree lined beaches of Troya I and II are the oldest you'll see on Costa Adeje holidays, but that’s by no means a bad thing. Over years and years of beach holidays they’ve been built up to be very well-facilitated with showers, toilets and changing rooms for added convenience. Troya II Beach: A continuation of the same stretch of coast as Troya I really, Troya II has the same grey-gold volcanic sand and clear waters. And with bars and restaurants all the way along the beachfront, you’re never too far away from a snack or drink, if you're not on Costa Adeje all inclusive holidays. Playa Del Duque: The most western beach on Costa Adeje holidays, it actually joins on to the resort of Playa Paraiso. It’s much quieter than the Troya beaches, and the sand is a slightly lighter golden variety since it was imported to cover the black volcanic sand that naturally occurred here. Palm trees and pink flowers make for a pretty backdrop to the beach. Playa La Pinta: Costa Adeje’s smallest beach is close to the marina where diving and sailing activities are available. The dark, flat sand is pleasant enough, although there are better beaches to make the most of your holidays in Costa Adeje. Coeur de Filet: Modern fine dining with influences of French cuisine. The service here is impeccable – the waiters really know their stuff and can recommend the meals you might prefer and the best wines to go with it. Spinach salad with Shitake Mushrooms and Sole with Black Risotto are just two of the innovative dishes you could try. It’s a great way to treat yourself whilst on holidays to Costa Adeje. Rosso Sul Mare: A classy Italian restaurant with wonderful sea views on the terrace and elegant decor inside. You could go for classics like freshly-made pizza or Beef Carpaccio, but they also have a good selection of fish dishes such as Lobster Spaghetti and Warm Octopus with Potatoes. Meals are surprisingly good value and is the ideal restaurant to choose if you're on cheap Costa Adeje holidays. El Molino Blanco: A brilliant eating experience for your holidays in Costa Adeje, with an adventurous menu that includes Ostrich and Wild Boar. There’s entertainment with pianists and violinists most nights, in which the chef usually takes a star role with his singing! If you choose to eat outside, the leafy terrace gardens are beautiful too. Harley’s: With a converted Cadillac serving as a restaurant table and a Harley Davidson bike inside, this classic American diner offers a fun eating experience great for families on cheap Costa Adeje holidays. The home-made burgers are a real speciality, and there are over 130 cocktails to choose from for your evening drinks. If there’s a game on, you’d be best off moving to Harley’s sports bar after dinner, as it has a 2.5 metre screen! Entertaining holidays: Many of the bars on Costa Adeje holidays are catered to the British meaning you get a friendly crowd, familiar drinks and lively entertainment. The Moonlight Bar often has singers and dance acts that you can watch for free while you enjoy your drinks. Likewise, the Temple Bar is an Irish themed pub with bands playing every night. Shopping centres: Costa Adeje holidays have become rather renowned for having excellent shopping centres. Clean, modern and air-conditioned, these malls make your souvenir shopping stress-free on holidays to Costa Adeje. Gran Sur complex has 7 cinemas, 30 branded shops and a drive-thru McDonalds. Plaza El Duque is an ultra-contemporary centre with high-end boutiques like Cartier and Spanish label Escada. There’s also a huge indoor children’s play park with mini-golf and bowling.